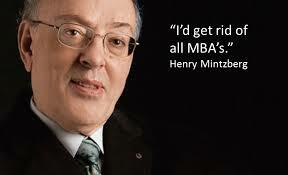 Henry Mintzberg is my hero – there I said it! If I was asked which three living famous people I would you have around for “dinner & discussions”, Henry’s name would top the list. So why does he grip my imagination? On the first front, he is an unashamed fan of intuition (“Henry Mintzberg explains that strategic thinking cries out for creativity and synthesis and thus is better suited to intuition than to analysis.”) in a world that still pays homage at the analytical altar of Strategy Planning. He is also not scared of qualitative research. How can you not love this view by him from a romping essay he wrote about theory development? …the impression [exists] that “quantitative” research is somehow proper – i.e., “scientific” – even if it contributes no insight, while qualitative research is something to be tolerated at best, and then only when exemplary. This is the double standard that pervades our academic journals to their terrible discredit. It also manifests itself destructively in doctoral courses that teach quantitative methods (mostly statistics) as rites of passages. Those who cannot handle the fancy techniques cannot get the doctoral degree, even though there is all kind of wonderful research with no numbers. Why not instead preclude from doctoral programme students incapable of coming up with interesting ideas. Imagine that! You will note this comment from him also ticks my third point! Unlike other leading thinkers in the world of management science, Minztberg does not state principles (like mathematical axioms) and then prescribe them as “best-practice”. He observes what (successful) managers do and – then after inducing meaning from the patterns he discerns – describes these “realities” in a form that is intelligible and useful to practicing managers. So unlike Henri Fayol (1841-1925) who declared that the function of management is to Plan, Organise, Direct and Control, Henry Mintzberg concerns himself with what managers actually do in their hectically interrupted professional lives (in contrast to the seemingly cool and cerebral world that Fayol envisions). And his formulations of these hard-won insights have also developed and been revisited by him over the years. I will contrast two of his iconic representations of the host of activities that form an integral part of a manager’s life (whether they are enumerated in the manager’s Job Description or not!). A synthesis of these findings paints an interesting picture, one as different from Fayol’s classical view as a cubist abstract is from a Renaissance painting. In a sense, this picture will be obvious to anyone who has ever spent a day in a manager’s office, either in front of the desk or behind it. 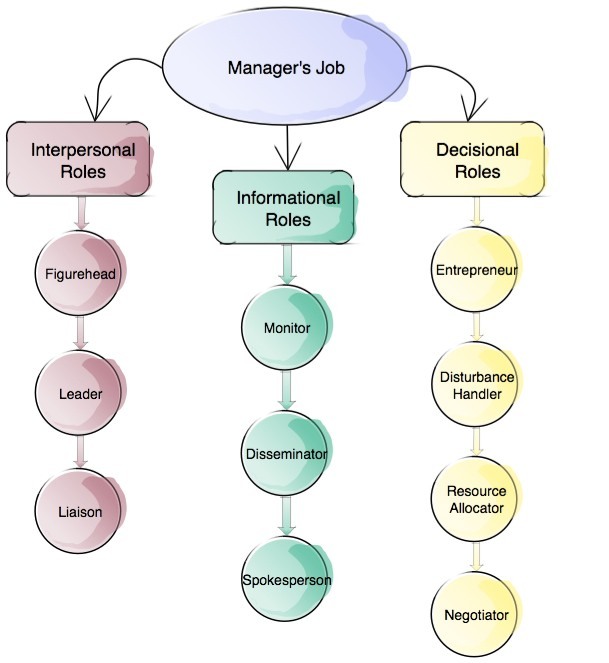 His description of the roles a Manager plays contains a mix of the expected ones (Monitor, Disseminator and Resource Allocator). But it also contains a number that are not implied by the Fayol P/O/L/D model, like Figurehead, Disturbance Handler and Negotiator. He observed that “every manager must perform some ceremonial duties” (the Figurehead). Job descriptions are usually silent on this one! But more modern writings on “Leadership” dwell significantly on the symbolic aspects of a manager’s workplace contribution. Mintzberg is showing us the practice of managing occurs on three planes and moves from the conceptual (centre) to the concrete (edges): with information, through people and then directly to action. And it also passes through the manager’s mind (the valuable cerebral activities of framing & scheduling)…! 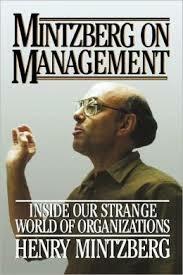 The last perspective of Mintzberg’s I want to enthuse about is his take on the various Styles of Management. Using a simple assessment a manager can determine her style. Mintzberg does not say there is one-best style. He does warn however that being too much in the Science –calculating (cold?) – or Art corners – narcissistic – could present a problem. 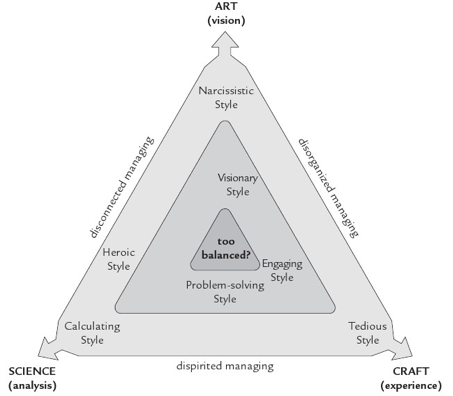 Also a style devoid of any Science sentiment will be experienced as “disorganised”; no Art and you have “dispirited managing”; no Craft and it will come across as “disconnected”. I love the fact that Henry does not follow the herd. He is a path-finder, if not a path-maker. I will give one example germane to this post. He has not written one book on Leadership. Only on Management. Yet he speaks a lot about leading. 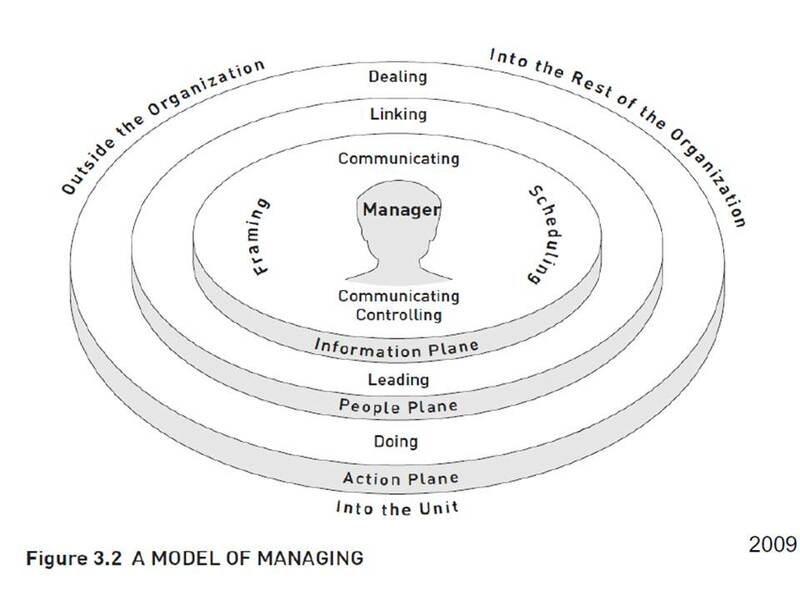 Mintzberg argues that leadership and management need to both exist in the managerial role. Here he is joined by another of my heroes Elliott Jaques (sadly deceased). Jaques (also a contrarian) denied the specious dichotomies created between so-called leaders and managers. He referred only to “managerial leadership” which is a role. So since two of my heroes are united on this touchy issue (on the non-popular side) I readily feel a frisson of delight. But Elliott deserves his own series of posts. More anon.